TV show dates: September 10, 2017 — present. Performers include: Seth MacFarlane, Adrianne Palicki, Penny Johnson Jerald, Scott Grimes, Peter Macon, Halston Sage, J Lee, Mark Jackson, Chad L. Coleman, Norm Macdonald, Larry Joe Campbell, Victor Garber, Brian George, and Rachael MacFarlane. 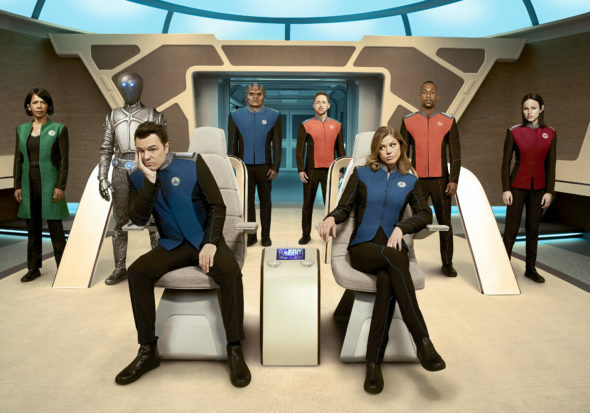 From creator and star, Seth MacFarlane, The Orville TV show is a live-action space adventure, set 400 years in the future. The story centers on the crew of a mid-level exploratory spaceship, The U.S.S. Orville. In 2417, Ed Mercer (MacFarlane) is promoted to captain the Orville, with the assistance of First Officer Kelly Grayson (Palicki). Unfortunately, she’s his ex-wife, and her presence acts as a bridle on his enthusiasm. Dr. Claire Finn (Jerald); helmsman Gordon Malloy (Grimes); Lt. Commander Bortus (Macon); his mate, Klyden (Coleman); security officer Alara Kitan (Sage); navigator John LaMarr (Lee); and A.I. life-form Isaac (Jackson) round out the crew. Whether facing off with the Krill, a dangerous alien race, or attempting rescues on behalf of the Planetary Union, these humans and aliens still must deal with their mundane issues and each other. What do you think? Do you like The Orville TV series? Should this TV show be cancelled or renewed for another season on FOX? My wife and I love the Orville. We hope it is renewed for many more seasons. My wife and I both love The Orville. Keep it coming — please. I truly enjoy watching The Orville. It’s a rare blend of comedy and serious issues, couched in science fiction terms. I never miss an episode! BEST SHOW ON TV RIGHT NOW. KEEP IT GOING. I love The Orville and hope it is around for many years to come! Keep The Orville around! It’s a better Star Trek than Star Trek right now. I Love this show! Best show on the network with science and humor. We really love this show, not only are we fans of Seth Macfarlane, but we love how original the stories are. There is humor and seriousness that blend well and make you think about the show long after it is over. I sincerely want this show to continue on, with more of the unique stories that makes it a really great show!